Approach a pond in July or August and crouch down. 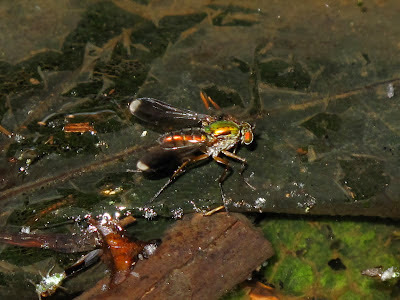 Focus on the surface of the water, checking the floating leaves or debris by the water edge and you will likely see jittery, shiny green flies. Get comfortable and watch them for a while, it takes some time until you can transport yourself to this small, alien world. 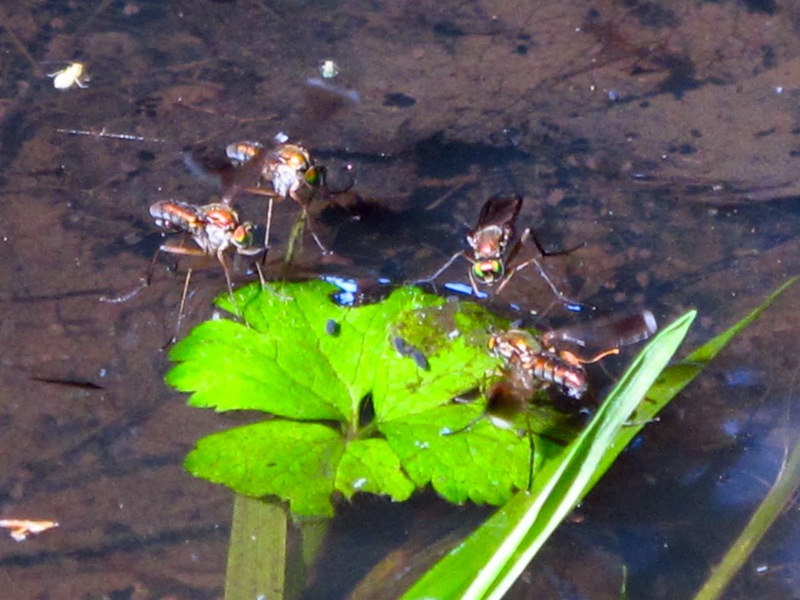 These are long-legged flies, Poecilobothrus nobilitatus. They like to rest on floating objects or the mud on the edge (above), but they are also able to walk on the water surface. 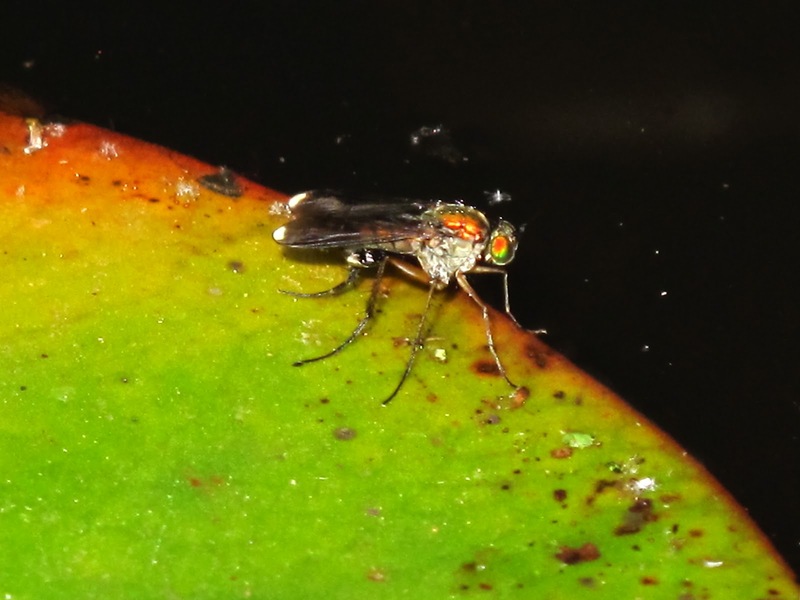 You will notice that some flies, the most active ones, have smoky wings with bright white wing tips - they are the males (top shot). Clusters of males may dance around single females, which lack the white wing marks (below). To start courtship, the male focus on a female and approaches her, then he opens his wings in straight angles to his body and buzzes them quickly before closing them again, the wing-waving display, which is just a component of their complex and spectacular courtship. Here several males circle a female wing waving, although the wings are barely visible as they are buzzing them. The three males court a female, which is watching the male in the right. I took a little clip of their courtship earlier today. The details of the courtship are a combination of wing waving and aerial acrobatics too fast for the human eye to follow, but they were described in detail by M.F. Land, which examined an hour of videos of courting flies in a pond in Sussex. The following figure from his paper represents the longest bout of filmed courtship, which was interrupted by the male chasing another male. Wing waving upon approach to a female is followed by hovering in front of her and flying over the female and back, and more wing waving. Courtship is often interrupted by chases to other males and then returns to the same female to carry on. UPDATE: Thank you to Morgan Jackson for pointing out that this fly was one of the species in the Name a Species 2012 competition and won the lovely English name of Semaphore fly. Cool find! This species was one selected for the Natural England/Guardian "Name a Species Competition" this summer, with the winning common name being Semaphore Fly (after the displaying of the white wing tips I imagine). Thank you Morgan, I was aware of its presence in the competition, but was unable to find the winner name. I'll upgrade the post accordingly, cheers! I've been trying to find out what this fly was and thanks to this post finally have! We have a fairly new pond that was teeming with mosquito larvae. 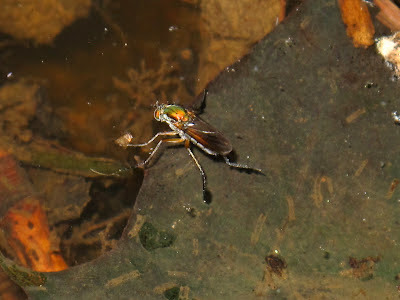 A few days ago I noticed five or so of these flies (initially thought it was some kind of pond skater), then a few more the day after and spotted they were hunting the mosquito larvae, grabbing them out of the water and then flying off to eat. Yesterday and today the pond has been covered in them, loads of courting behaviour (and not many mosquito larvae left!) They've been fascinating to watch. I wonder what they're going to eat tomorrow!